A good series that suffers from a weak main character. This series follows the exploits of the Aizawa brothers. Suguru Aizawa, the older brother, is a soccer prodigy in all aspects of the word, both feared and respected by players worldwide. Kakeru Aizawa, the younger brother, was also somewhat of a prodigy who was able to fully support his older brother's abilities to allow Suguru to play his type of soccer unrestrained. Due to some events before the series starts, though, Kakeru had decided to stop taking an active role on the field and instead took a position as the soccer team's manager, leaving Suguru to play alone. Through some incidents early on in the series, Kakeru is thrust into the limelight and back onto the field. Suguru is obviously the better player in all aspects (his one flaw is his teammates not being able to keep up with his plays), but the series focuses entirely on Kakeru and his development from a relatively unskilled player with some serious potential into a purebred Striker feared throughout the world (at least at the high school level). As for the actual series, it's pretty good. In typical sports anime fashion, every player has quite a bit of untapped potential, but the team as a whole follows the trend of hitting a wall -> failing -> training -> developing -> overcoming their failure -> winning -> hitting another wall. It's a tried and true formula that works really well with the series. One of the biggest shortcomings, though, is the main character of the series, the Knight in the Area himself, Kakeru Aizawa. He starts out the series with good main character potential, as he has a few very big strengths that are hampered by a lot of weaknesses that he has to overcome in order to use them. The problem lies in his development as a whole. Kakeru develops PAINFULLY slowly, almost to the point where it seems he's hardly progressed at all throughout the series. In the first half of the series, this is fine, but it gets very, very noticeable in the later episodes, as Kakeru is constantly failing in a myriad of ways. Most gratingly, it seems that he falls for the same exact tricks and traps all the time and never learns from them. Similarly, if he tries something on the field that doesn't work, his answer is almost always to try it again, in the exact same way, yielding the exact same results.Even when he does make strides with his character and playstyle, it's almost always driven by some outer force, like his childhood friend Nana (Seven), one of his teammates, or sometimes even one of his rivals that gets frustrated at Kakeru's slow pace. If Kakeru's development brings the score down a tad, the development of the rest of the players of the team evens it back out. There's a wide variety of personalities on the field and each one of them gets a good amount of characterization and at least a little screen time to outline their own struggles. The rival schools also have a surprising amount of personality, with each of them having at least a handful of memorable characters. Overall, I'd recommend The Knight in the Area if you like soccer or sports anime in general. As a warning, if they never release a second season, it might be better to just read the Manga. The series ends with a huge cliffhanger and leaves about 95% of the character's stories completely unresolved.If you don't mind that, though, then go for it! I am usually a big fan of sports anime as they often instill an atmosphere of team work and hard effort that can be inspiring. Major and Kuroko's Basketball are fine examples of this. When I saw the preview of this anime, it looked as promising as those others mentioned. Unfortunately that wasn't the case. The storyline had really good potential but ended up lacking the intensity and vision it needed. The games bored me so many times, I ended up fast forwarding a few occasions. The characters fall flat on their face. The main character is so weak, useless, and pathetic, he makes Sena look good. The others have so little depth to them, they only drag the anime down as it feels the need to give each some attention here and there. I really tried to love this anime, I really did. I wanted a soccer anime that I could hold in my heart. Sadly, this is not it. This was a really good anime. I liked the brother's spirit being featured and the women's team that does get spotlighted throughout the anime. The one thing holding this anime back is the ending. The series at the end felt rushed and there were still a lot of mysteries that needed to be concluded. Would love to see a second season of this and what they could do with it. I thought this was a great anime, I really enjoyed it. Usually when I take a break from action/adventure animes I run over to sports or a slice of life type animes. When I came across this anime I was like "why not, I have nothing better to do". I was actually thinking it was going to be a typical sports anime that has an attention grabber then the deal breakers would start rolling in. What I really liked about this anime was the fact it had a little bit of everything. It had the brotherly love, the comedy, the action, some romance. 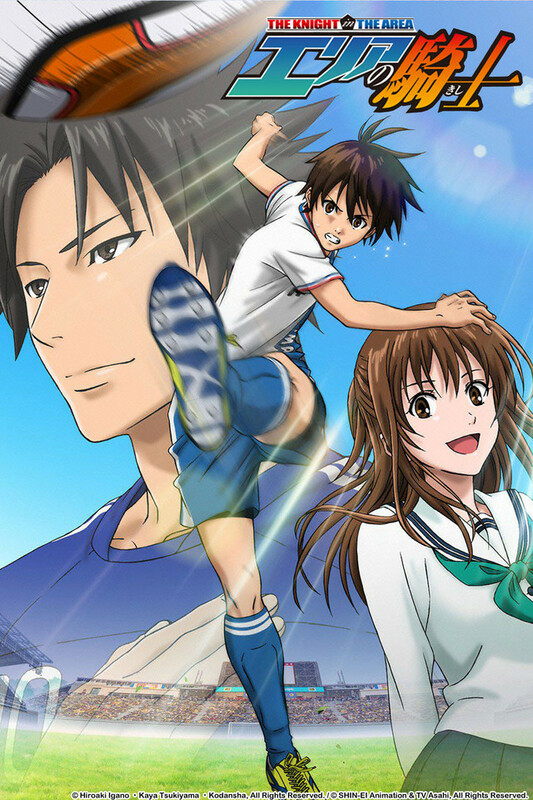 It was a sports anime with a slice of life which I really like. I would really love to see a season 2 cause there is a lot of unfinished business like the new phi trick or how asuka won't fall of the phi trick again. And let's not forget about the out come fr the finals and kakeru going to the World Cup. And they can even take it further than that and have him go professional and play along silva. I love this series and it's deffenetly going on my re-watch list but it also needs a second season!!!!! At first i was not impressed until the story got crazy interesting. Now i am a big fan of this series. I am always waiting to see what happens in the next episode. sometimes i get so excited that i rewatch the entire series. So far its like an eyeshield21 meets soccer, you have lively characters an its all centered around a sport. Taking a differant turn from football is a good approach as Im really enjoying it right now. So if you loved Eyeshield 21 you are sure to like this alot. I didn't think I was going to like this series. I am not a football fan and normally don't like sports anime. I was surprised to find out that I actually loved this series! The character development is great. There are sometimes that the soccer explanations are a little too detailed and of course it's not explaining soccer how it is played in real life. Regardless, I think it is this attention to detail that makes this anime interesting. Here is to hoping for a season two! I start watching this anime about 1 month after its premiere; the beginning looks awesome, however, after the first episodes it become really slow and does not show any real development (main char and story). Not sure about the manga but the anime it kind of disappoint me. I was expecting something like EyeShield 21 or Captain Tsuba, but is not like that. Empece a ver la serie 1 mes despues de su estreno; al principio me parecio genial, sin embargo despues de los primeros episodios se torno bastante lenta y no mostro ningun desarrollo real (personaje principal e historia). No puedo hablar del manga pero el anime me decepciono. Esperaba algo asi como EyeShield 21 o Los Supercampeones, pero no fue asi. De nuevo; no estoy diciendo que la serie sea mala, es solo que le falta la magia para convertirse en un buen anime. Veanla y vean de que hablo. So before I talk about the show. I just gotta say to the anime gods out there, please allow a sports anime to have an actual ending for once. The Knight in the Area at least acknowledges its not doing more episodes so they give us some closure for this show, not in terms of finishing story. But they at least tried to make it seem like a decent ending. The problem with the anime industry and why it's not mainstream is because the stories are often unfinished, or to short for folks to care. The thing is most of these anime have continued success with the manga, but not all manga is written in english. And i hear learning a new written language is tough. This is a fun anime. It teach a lot about soccer, and friendship. It is also a emotional anime. This is one of the best anime I have watched. But it stop on Ep 37. I wish it would go on, because I bet it would show much more about soccer and friendship. This anime would totally catch your heart. I RECOMMAND YOU TO WATCH IT!!!!!!!!!!! !